Through flower donations from farms and wholesalers, and through tens of thousands of volunteer hours, The Bloom Project brings flowers into the lives of people in hospice and end-of-life care. The phrase “flowers feed the soul” is one you often hear, on greeting cards, on hand-painted signs, in all sorts of sentiments. And in the opinion of today’s guest, flowers not only feed the soul and spirit, they play an important nurturing role in health care. My guest today, Heidi Berkman, is the founder and president of The Bloom Project. 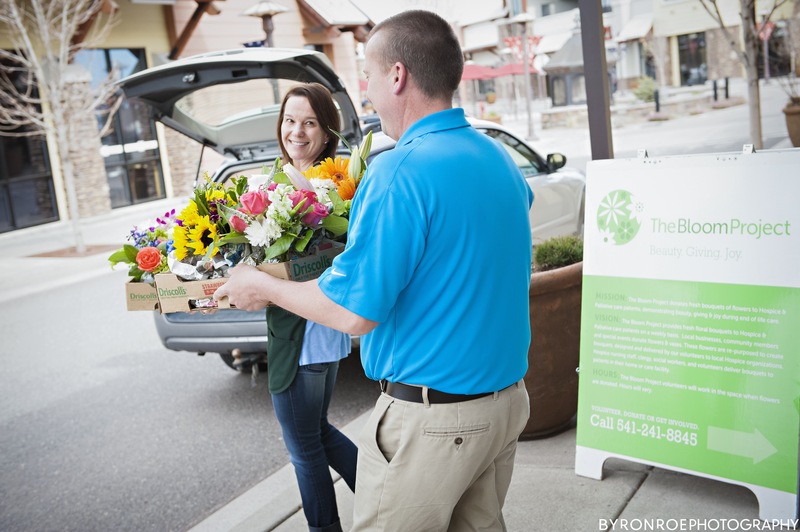 Based in Portland, Oregon, The Bloom Project has been giving the gift of fresh floral bouquets to hospice and palliative care patients since 2007. I’m posing with Heidi Berkman (left), who runs The Bloom Project, driven by the mission to harness the healing power of flowers. 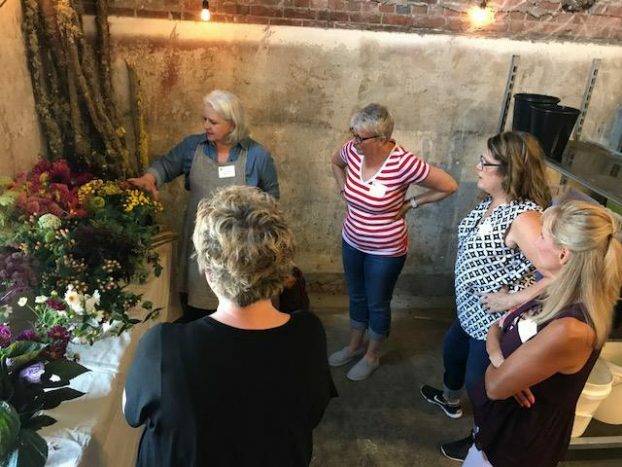 We gathered earlier this week for a “Seattle Whirlwind” auction package to which Slow Flowers donated a workshop at the Seattle Wholesale Growers Market. Heidi reached out to me to introduce herself several years ago, and then, through our mutual friend Christina Stembel of Farmgirl Flowers, I really got to spend time with Heidi, both talking about the floral business, but also doing fun things like when all three of us traveled to Detroit last October at Lisa Waud’s invitation to speak at Detroit Flower Week. 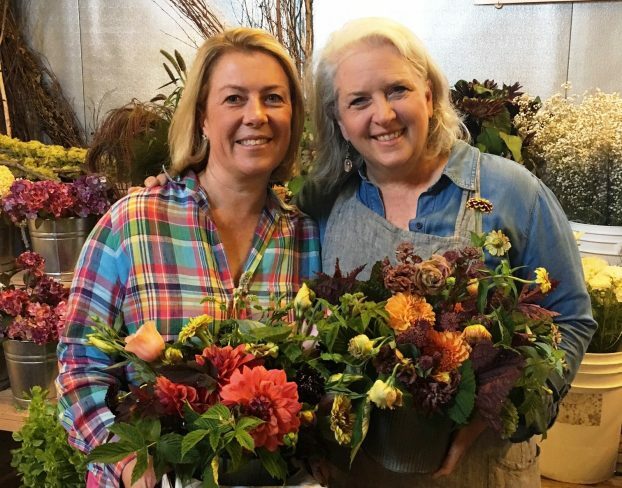 The first time Heidi and I actually met in person was April of 2016, when I was in Portland to speak at the Portland Garden Club’s annual flower show. Heidi put together a tour and reception for me to learn more about The Bloom Project, and to meet key board members and volunteers, as well as to see the beautiful workshop and studio headquartered at Teufel Holly Farm, just west of Portland. Donated by Larry Teufel, flower farmer and nurseryman, the space is akin to what you’d see at any large production facility, with tall work tables, great light, and plenty of cooler space for the flowers. Pretty impressive to see where The Bloom Project’s volunteers receive and processes donated stems of flowers and foliage, as well as where the gift bouquets are created, packaged and prepared for delivery to the ultimate recipient. Heidi and I have been talking about when would be an ideal time to feature The Bloom Project on the Slow Flowers Podcast and with our mutual travel schedules, we waited until now. 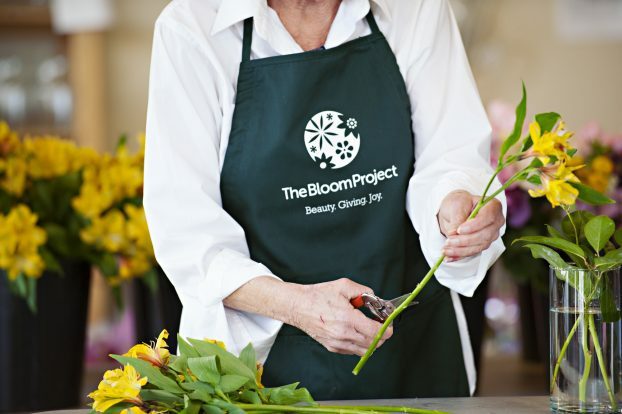 This week, I’ll be hosting a fun event as a Slow Flowers donation to The Bloom Project. At the annual Bouquets of the Heart auction that benefits the organization, I joined Larry Teufel in donating a “Seattle Whirlwind” day-of-flowers package for five guests. Larry Teufel (left, with me) flew the auction package winners and their guests to Seattle (from Portland), on his beautifully-restored classic aircraft. This week, Larry, who pilots his own plane, flew the winning bidder and a few of her friends to Seattle . . . I hosted them on a tour of the Seattle Wholesale Growers Market, which gave me a chance to talk about the mission of Slow Flowers and the importance of supporting local, seasonal and sustainable flowers, and the people who grow and design with them. Debbi, Susan, Debra (me), Leianne and Susan — showing off our bouquets in Seattle as part of the auction package benefitting The Bloom Project. We had a short design session and everyone left holding a bouquet with a story. I think that story — the story of showing compassion through flowers — is what The Bloom Project is all about — and Heidi is a powerful communicator for her cause and mission. 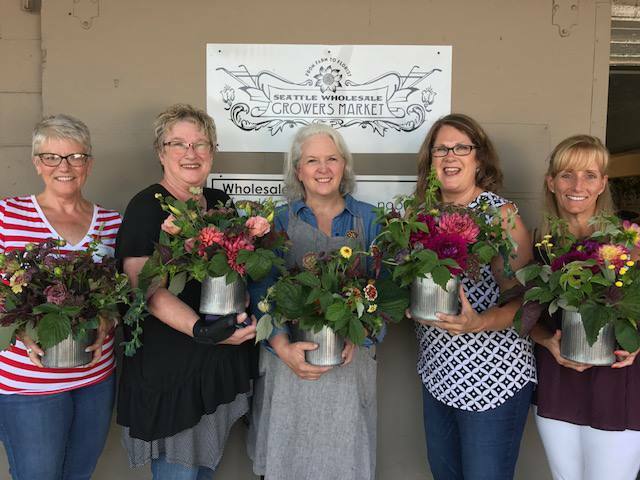 The project started in Heidi’s Central Oregon garage, beginning with a few flowers and a few volunteers who wanted to create something special — bringing beauty and joy to those in end-of-life care. 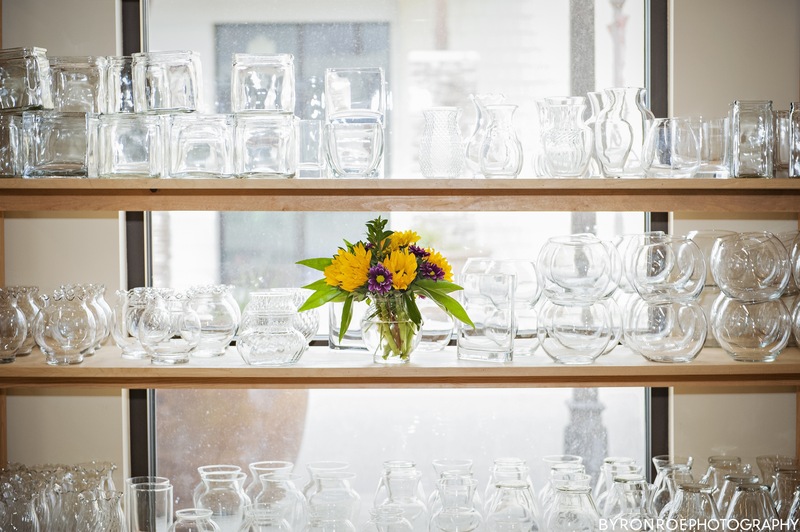 Many, including Heidi, had experienced the loss of a loved one in hospice care, and recognized that they could make use of resources (flowers) that would otherwise be tossed out. Over the last decade, The Bloom Project has continued to grow and support hospice and palliative care agencies across the state of Oregon, with the Portland Metro area as its base. Volunteer teams have flourished, supporting the organization’s goal of serving additional patients and families. 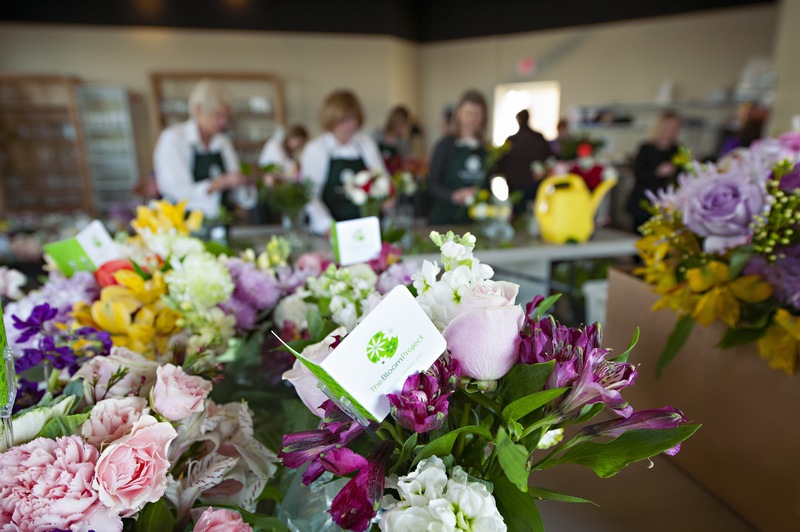 Donated workspaces, supplies and equipment, provide a wonderful place for volunteers to come together to create hundreds of beautiful bouquets each week. The Bloom Project relies on a committed group of floral and community partners who support its efforts and mission. Heidi has twenty-five years of meeting and event planning experience with a strong background in retail marketing and extensive nonprofit experience. Her deep appreciation for the work of hospice comes from the personal experience of watching a loved one being cared for. 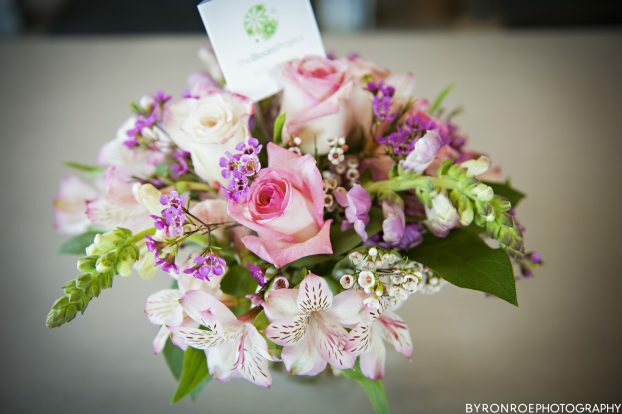 She has always enjoyed working with flowers and says she is grateful to be able to create bouquets with donated flowers that can provide encouragement to others instead of being discarded. Heidi’s passion for The Bloom Project has motivated her to share the story and spread the word about the power of flowers. 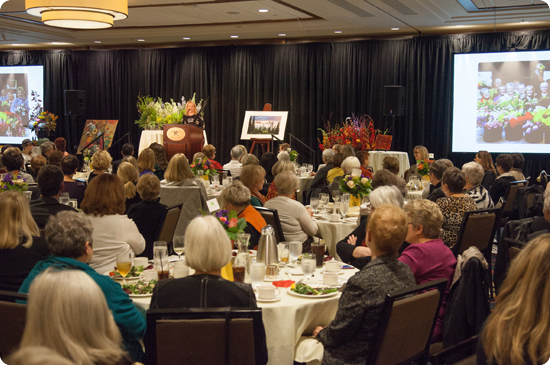 The Bloom Project’s Bouqets of the Heart event takes place on October 27, 2018, in Portland. Her vision for the organization is to continue to network people and resources in communities where hospice and palliative care organizations are serving patients and their families during end-of-life care. This simple act of kindness can be given by gathering a team of committed volunteers, sourcing flowers and supplies, establishing a workspace and obtaining the support of the surrounding community to provide in-kind products and services along with financial contributions to support the growth and impact of the organization. Details on The Bloom Project’s Bouquets of the Heart event, October 27th, in Portland. Maybe I’ll see you there! Thanks again for joining me today. My take-way from this conversation with Heidi is that we shouldn’t ever discount the impact that flowers have in the lives of our community, team members, customers, and clients. These are more than luxury goods, more than perishable indulgences. A flower contains the expression of life and beauty — and can touch the heart and the senses where words may not be adequate. The Slow Flowers Podcast has been downloaded more than 225,000 times by listeners like you. Thank you to each one of you for downloading, listening, commenting and sharing. It means so much. This entry was posted on Wednesday, August 23rd, 2017 at 8:45 am	and is filed under Blog Posts, Creativity, Entertainment, floral design, Flower Farming, General, Podcast Episodes, SLOW FLOWERS Podcast, Storytelling. You can follow any responses to this entry through the RSS 2.0 feed. You can leave a response, or trackback from your own site.